VIDEO: Swim Safe This Summer! Atlanta Red Cross encourages you to have a safe summer of swimming! Included are some important tips and tricks for staying safe in and around the water for you and your family. Make sure to sign up for CPR/AED courses at http://atlantaredcross.org/ and water safety courses at your neighborhood county aquatic center. 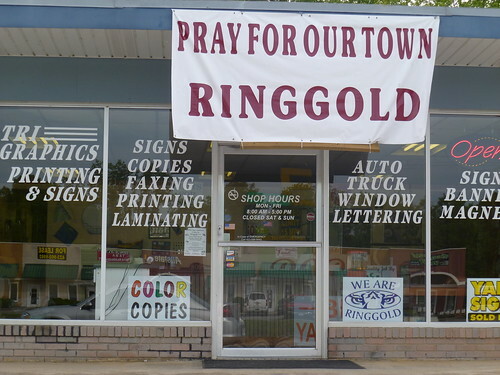 A sign reads "Pray for our town Ringgold" in front of a small business just outside of downtown. I’m going to go ahead and say it: Ringgold, Georgia looks like a war zone. In the waning days of April, mother nature decided to rear her head and it was by no means pretty. As cliches go, I’m 2 for 2, but in this case it definitely applies. Last week, Ruben, Tina, and I headed from Atlanta to Ringgold–one of the hardest hit areas of the state– to get an idea of just what the situation is up there. What we found were demolished houses, businesses, and a downtown area which has suffered significant damage (both physically and emotionally). But what was most striking was the capacity of compassion and drive of those who seek to help others (many of whom are working for free and many of whom have endured damage as well). The Red Cross had an immediate presence on that front. “It’s an honor to be able to serve” said Nigel Poole, Americus Red Crosser and Emergency Response Vehicle (ERV) driver. We shadowed Nigel for a large part of the day as he went from neighborhood to neighborhood and shelter to shelter, feeding and supplying tornado victims across Ringgold. “It’s a blessing” said Mrs. Allen, a displaced resident of Ringgold. 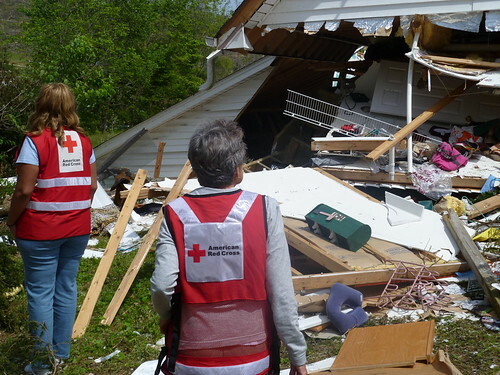 “A lot of the residents are without power and water so they can’t cook.” Mrs. Allen’s home was completely destroyed and she was grateful that she could count on the Red Cross for food and comfort. 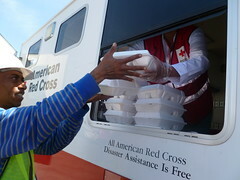 “The Red Cross has provided hot meals for everyone. It’s a god send” she said. Some neighborhood homes were entirely destroyed. In fact, one home “pancaked” meaning that a bottom floor of a multi-floor home gave way for the top floor to fall (pictured below). Remarkably, the family survived. A lone refrigerator helped save the life of the lady of the household. The very refrigerator she fought to rid of throughout the year. Red Cross disaster volunteers, Mollie Hamby and Mona Balogun, survey a demolished home in the Salem Valley Rd. area of Ringgold. Remarkably, the family survived the tornado. After a long day it is clear that many people rely on Red Cross’ services in order to get by. It was even clearer that my “long day” is nothing compared to the weeks of hard work of those Red Cross volunteers at the scene, not the mention the hardship of those who are now homeless and in need of our help. 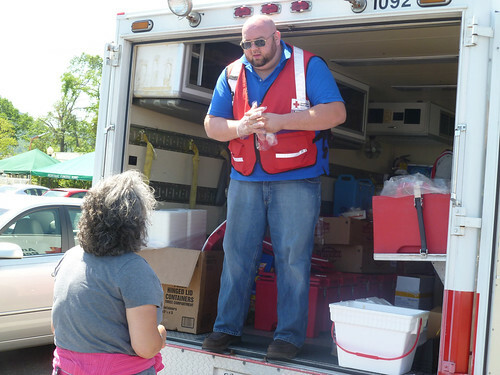 Whether it be food, water, shelter, comfort kits, cleanup kits, or medical needs, the Red Cross is there to help. OR Click the “Donate” tab at the top of the page for more information. In the Spring of 2008, severe weather had a major impact on the state of Georgia, as it wrecked lives and damaged property in several Georgia Counties. Sara Hicks, Community Disaster Educator for the Red Cross Metro Atlanta Chapter, shows you how to “Be Red Cross Ready” for the 2009 Severe Weather Season. ATLANTA, November 10, 2008 — As Georgians prepare Thanksgiving Day meals, the Red Cross urges families to be cautious in the kitchen and to take action to prevent a home fire. Thanksgiving Day has more than double the number of home cooking fires than an average day according to the U.S. Fire Administration. In fact, each year more than 4,000 fires occur on Thanksgiving Day. Keep potholders and food wrappers at least three feet away from heat sources while cooking. Turn off stoves, ovens, and ranges when responsible adults leave the kitchen. Set timers to keep track of turkeys and other food items that require extended cooking times. If using turkey fryers, the American Red Cross strongly recommends that you follow all manufacturer guidelines regarding the use of these appliances. If you are entertaining guests, it’s a good idea to designate a responsible family member to walk around the home making sure that all candles and smoking materials are extinguished once guests leave. The Atlanta Red Cross responded to more than 880 disasters last year, typically house and apartment fires – and provided 5,823 families with emergency assistance including shelter, food, counseling, and more. This support is dependent on the generous financial contributions of the public. You can help the Atlanta Red Cross continue to be ready to respond and help fire victims by making a financial contribution today.